The ability of our new president to govern effectively and provide world leadership will depend profoundly on advancing and utilizing the knowledge and tools of science, engineering, and medicine. In the 20th century, U.S. science, engineering, and medicine nearly doubled our life span, protected our nation’s security, fueled most of our economic growth, sent us to the moon, fed the planet, brought world events into our living rooms, gave us freedom of travel by air, sea, and land, established instant worldwide communications, enabled ubiquitous new forms of art and entertainment, and uncovered the workings of our natural world. It was a century of speed, power, and new horizons. We have come to take all this for granted. The 21st century will be very different. And nothing can be taken for granted. To grasp the great opportunities of our times and to meet our challenges – from economic competition to energy, from healthcare to education, from security to infrastructure – federal policy and action must be informed and enabled by a vibrant science and technology enterprise. Indeed our national comparative advantage is a strong S&T base coupled to a free market economy and a diverse, democratic society. We will soon feel the full force of global competition. Jobs will follow innovation wherever in the world it is found, and innovation will follow basic research wherever it is conducted. All our children must be inspired and educated for productive, well-paying jobs in this knowledge economy. Charles M. Vest is president of the National Academy of Engineering. He was elected to a 6-year term in July 2007. He also serves as vice chair of the National Research Council, the principal operating arm of the National Academies of Sciences and Engineering. He is also President Emeritus of the Massachusetts Institute of Technology (MIT). Before he became president of MIT in 1990, he had been provost and vice president for academic affairs at the University of Michigan. During his early career in mechanical engineering, he taught heat transfer, thermodynamics, and fluid mechanics at the University of Michigan. His research focused on thermal sciences and the engineering applications of lasers and coherent optics. His work included the development of techniques to obtain 3-D holographic interferograms of refractive indices in thermal flows. He is the author of numerous papers on these subjects and one book, Holographic Interferometry. He has also written two books on higher education and research. From 1990 to 1999, he served on the Massachusetts Governor’s Council on Economic Growth and Technology, and in 1993 and 1994 he chaired the President’s Advisory Committee on the Redesign of the Space Station. He has been a member of the President’s Council of Advisors on Science and Technology since 1994, and from 2002 to 2003 he chaired the U.S. Department of Energy Task Force on the Future of Science Programs. He was a member of the Secretary of Education’s Commission on the Future of Higher Education (the Spellings Commission), which issued its report in September 2006. He served on the Secretary of State’s Advisory Committee on Transformational Diplomacy and the Rice-Chertoff Secure Borders and Open Doors Advisory Committee. He also served on the Commission on the Intelligence Capabilities of the United States Regarding Weapons of Mass Destruction. He served as vice chair of the U.S. Council on Competitiveness for eight years. Charles Vest was elected a member of NAE in 1993 and served as an NAE councillor from 2005 to 2007. He has also been a member of several NAE, NRC, and National Academies committees, including the authoring committee of the recent influential report, Rising Above the Gathering Storm. 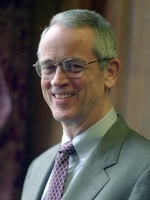 In 2000 he was awarded the NAE Arthur M. Bueche Award for “outstanding university leadership, commitment and effectiveness in helping mold government policy in support of research, and forging linkages between academia and industry.” He holds three degrees in mechanical engineering, a B.S. from West Virginia University (1963) and an M.S.E. (1964) and Ph.D. (1967) from the University of Michigan. He is a fellow of the Optical Society of America, the American Academy of Arts and Sciences, the American Association for the Advancement of Science, the American Society of Mechanical Engineers, and the Association for Women in Science. He is a member of Tau Beta Pi, Pi Tau Sigma, and Sigma Xi. Among his most recent awards are the ABET President’s Award from the Accreditation Board for Engineering and Technology in 2002 and the Phillip Hauge Abelson Award of the American Association for the Advancement of Science in 2006. In 2008, he was elected a member of the American Philosophical Society. He has also received honorary degrees from ten universities. In 2006, he was awarded the National Medal of Technology. President Kenneth Haapala called the 2,246th meeting to order at 8:16 pm December 12, 2008 in the Powell Auditorium of the Cosmos Club. The minutes of the 2,245th meeting were read and approved. uncovered the workings of our natural world. The 21st century will be very different. Nothing can be taken for granted, although we have a great advantage in a strong science and technology base coupled to a free market. We will soon feel the full force of global competition. The recent election was apparently a tectonic shift. It was apparently a generational thing. The new generation does not think, act or work as we do. It’s probably a good thing. Mr. Vest always tries to be optimistic. Thriving in the knowledge age requires knowledge. Where will it be found? If the central concepts of scientific, engineering, and medical knowledge are to be here in the United States, we must invest more in education and in basic research. This will happen only when our new president establishes a public vision of an America that will lead and prosper in the 21st century through knowledge and innovation. There are reasons to be optimistic. We hear actual, serious use of the term, “real economy.” There appears to be recognition of the need to do something about climate disruption and energy. Job creation is recognized as a real problem. We know better the importance of technical, mathematical risk evaluation. Green is a good word in business, and green action will follow. Leaders are arguing about what the right balance between R&D investment and shareholder return would have been at General Motors. The ethanol disappointment has spurred a real example of systems thinking. Steve Chu, the first scientist since Glenn Seaborg, has been named secretary of energy. Perhaps it is as Winston Churchill said, “You can always count on the Americans to do the right thing…after they have exhausted all the other possibilities.” Maybe we’ve reached a tipping point. But ths isn’t just about us. This is the age of globalization, actually has been for at least 20 years. This an age in which individuals, institutions, nations, NGOs, and social networkds must all simultaneously compete and cooperate. Meanwhile, the U.S. “market share” of science and technology has been dropping, partly because we are slipping and partly because others are gaining. China graduates five times as many engineers as we do. Engineers account for 4.5%, and declining, of undergraduate degrees. In Europe it is about 12%, in Asia 20%. Minorities and women are few in engineering, and as they gain, engineering may decline further. Some argue that the numbers are not of real concern. The market doesn’t show shortage of engineers. Engineers in the IT industry advise their children not to go into it. It was a great ride, but it’s over, they say. The international statistics show we are not so bad, we are actually about average. The problem is mostly in inner cities and minority communities. To these arguments, Mr. Vest replies: That’s the point! It was the availability of people educated in science, technology, engineering, and mathematics that enabled our wealth. The reduction of that supply is foreboding. Also, he is not comforted by the idea that we can import them. Indeed, statistics now indicate that many we have already imported are going back. While he is proud of the openness of American society and hopes it continues, he doesn’t believe we can rely on it to keep bringing talent here. The talent came for the unique opportunity; that opportunity is no longer found here exclusively. He finds the state of K-12 education alarming. He described a study that showed how American students see themselves compared with students of other nations. They see themselves at the top in math. Tests show them at the bottom. He doubts there is a simple answer, but he described two studies that indicate that there is only one variable that generally correlates with the success of high school students after high school. It is how well their junior high and high school teachers were educated in the subjects they taught. It makes the point that something can be done. Mr. Vest answered questions from the audience. Mr. Haapala presented a plaque commemorating the occasion to the speaker. He announced the next meeting. He made a parking announcement. Finally, at 9:42 pm, he adjourned the 2,246th meeting to the social hour.